1. 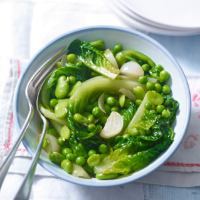 Bring a saucepan of water to the boil, add the broad beans and cook for 1 minute. Drain, rinse under a cold tap and peel off the skins. 2. Put 80ml of the chicken stock and brown butter into a small saucepan and heat over a medium flame until the butter has melted. Then, using a hand held blender, blitz the liquid until fully emulsified. Season with salt and freshly ground black pepper and put to one side. Cut the lettuces in half lengthways then in half again, retaining the core to keep the leaves together during the cooking. 3. Bring 1 litre water to the boil in a large saucepan with 1 tsp salt over a high heat. Prepare a bowl of cold water for refreshing the lettuce after cooking. When the water is boiling, add the lettuce to the pan for 90 seconds, remove with a slotted spoon and plunge immediately into the cold water. Remove the lettuces from the cold water and drain on kitchen paper then remove the core. 4. Place the remaining chicken stock in a saucepan over a medium heat and add the broad beans and peas. Simmer for approximately 5 minutes or until soft. Drain the peas and beans and discard the stock. Heat the stock-butter emulsion in a wide-bottomed frying pan and add the lettuce leaves to the pan for approximately 1 minute or until warmed through. 5. Add the peas, broad beans and pickled onions and warm through. Season to taste and serve warm.